Trail through the trees, a photo by @klawrenc on Flickr. 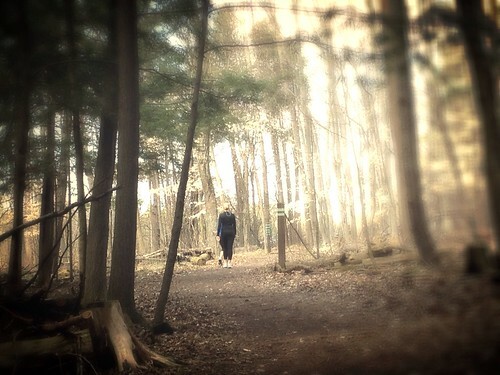 There are so many great places to walk - in and just outside of - Guelph. I grew up in the country and love that I have the option of walking on a trail by the river to work, and that I live near some amazing locations. On this, the eve of the May Health Challenge, I've decided to share my five favourite places to walk. Preservation Park, a 27 hectare urban forest on Kortright that connects with the Hanlon Creek Conservation area. Guelph Lake Conservation Area - trails and a man-made lake. GORBA's trail map is a great resource. Eramosa River Trail - follows the river from the Timber Bridge to Victoria Road. More information on Guelph and area trails is available on Guelph Area Trails and from the City of Guelph. If you have a great place to recommend, please leave a comment!